Vale Of Miscreation, a technical death metal group from Albuquerque, have speed and virtuosity to rival their big-label counterparts. Their set seemed hasty, but maybe this was due to the last-minute notice of their performance. (Born Of Osiris canceled less than a week before the scheduled concert.) This shortcoming aside, they were a satisfactory band, worthy of holding their own against the likes of Battlecross and Gwar, representing homegrown metal in a competitive industry that favors incumbent celebrities. Battlecross were considerably more thrashy, but with similar death metal roots. This self-described “blue collar thrash metal” outfit is simultaneously over-the-top and down-to-earth. The shredding solos and dynamic leads were anchored by a skeleton of percussion, hearty bass lines, and harmonized rhythms. These musical elements, plus the death metal gutterals of Kyle “Gumby” Gunther, made for a charismatic performance. Gwar has always been massively entertaining, if unstable, theatrical band. Even before the death of David Brockie (better known by his stage name, Oderus Urungus), the so-called “slave pit” has always been a constantly shifting line-up of musicians. The current lead singer is Blothar, an antlered humanoid from Scumdogia who sprays blood, piss, and various other disgusting fluids from his udders. The setlist included instantly recognizable favorites, such as Saddam A Go Go and Sick Of You. Even so, Gwar is not very heavy from a musical standpoint, as their shock value lies primarily their repugnant lyrics and, of course, exaggerated visuals. Overall, this concert was engrossing, but there were still some weak points. 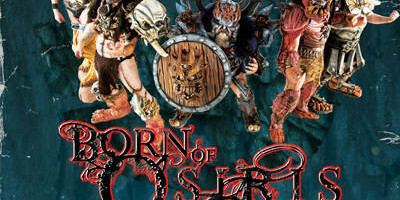 Many audience members, including myself, were disappointed by Born Of Osiris’ cancellation. Furthermore, the novelty of Gwar was riotous at first, but the novelty wore off as the show came to a close. 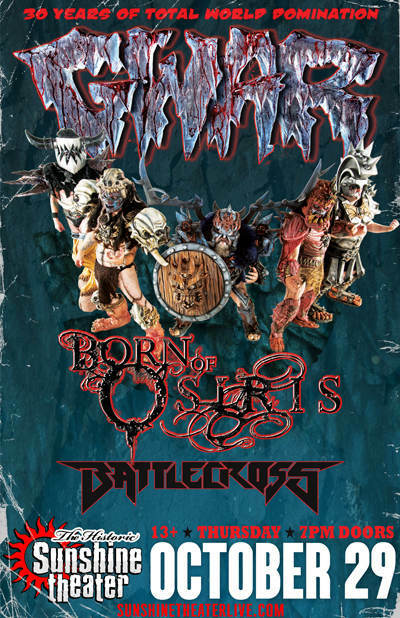 These flaws aside, the humorous banter and excessive violence of Gwar were stupendous, complementing the musical brutality of Battlecross and Vale Of Miscreation. The tarp over the sound booth was a hilarious cherry on top. Four stars out of five.